Combine the garlic, oregano, salt, chili powder, cumin, and black pepper. Add olive oil and mix well. Use a mortar and pestle to make a paste consistency, or mash with a fork. Wash chicken leg quarters and pat dry. Snip off any excess skin. Arrange the chicken pieces in a baking dish and pat the garlic mixture over each quarter. Pour 1/2 cup of chicken broth (part dry white wine, if desired) into the baking dish. Bake for 40 to 50 minutes, or until juices run clear. Delicious!! I needed to cook off some chicken and was really happy to find this recipe. I had all the ingredients and loved it was so simple and fast to put together. Of course, i never measure my garlic- just used LOTS AND LOTS!! Really made the house smell wonderful on a cold autumn day. This one is a keeper! This was perfect baked chicken. Flavorful & moist. I completely removed the skin from the chicken, so baked it covered with foil at 400 degrees, then about 10 minutes uncovered. looks great! Will have to try this soon. This has easily become one of my family's favorites. One thing I did differently, on accident, was poured the chicken stock in with the garlic mixture and poured it over the chicken. We actually prefer it that way, but either way...YUM! Made this tonight and it was the best chicken legs ive ever had. I will be using this recipe over and over. Nice combo of spices here! Looove garlic! That chicken looks juicy and delish! Sounds awesome! 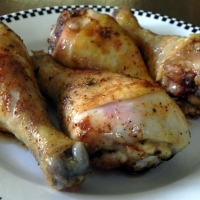 Love leg quarters, thighs are my favorite piece of chicken! oh white wine will be my choice. Lovely dish.